Keendoo is a software company spun off from VIF, a specialty ERP vendor serving the food industry for over 30 years. The Keendoo team, led by Christophe Mahé, Keendoo CEO and former VIF executive, had recognized years earlier that product information and lifecycle management was becoming increasingly complex for food manufacturers and retailers. A single frozen cheese pizza, for example, comes topped with more volume and varieties of product information than ever to be tracked, such as nutritional databases, supplier activity and packaging designs. It’s also common for a single food product to have hundreds of pieces of metadata associated with it, ranging from one or more commercial names for the product, possible allergens, packaging type, whether the product is organic and many more. Because the food industry is highly regulated, it is critical for food producers to effectively utilize product information to comply with industry standards. INCO, for example, mandates nutritional information labeling for all food products sold in Europe. This translates to more information and calculations required for each product. Existing PIM and PLM tools were found to be lacking the flexibility to handle regulatory standards and other key aspects of the food industry. Meanwhile, many companies still try to manage product information using spreadsheets; typically resulting in error prone, time-wasting silos of departmental product data. Christophe Mahé and his team decided to build a new, web-enabled solution to address these emerging challenges, using Nuxeo as their application development platform of choice to most effectively leverage their technical expertise and deep understanding of the food industry. Originally developed under VIF for its customer base of food producers, the Nuxeo-powered PIM/PLM solutions proved so successful that VIF spun off the solutions as a separate company, Keendo. Nuxeo stood out for its responsiveness during our evaluation process, Christophe Mahé says. We wanted to work with a vendor as a close partner and trusted advisor to help ensure the success of our project. Keendoo offers two modules, k.PIM and k.PLM, which use the same single integrated Nuxeo content repository. Although clients can implement a single module, they usually select both modules for a complete product information and lifecycle management solution. k.PIM is a product repository that provides centralized access to up-to-date, validated data provided by all departments. k.PLM enables tracking of all stages of the design of a new product, with functions for managing formulations, cost simulations, nutritional calculations, allergen management and the list of ingredients in a recipe. This is key, as each product can have hundreds of information fields and attributes. 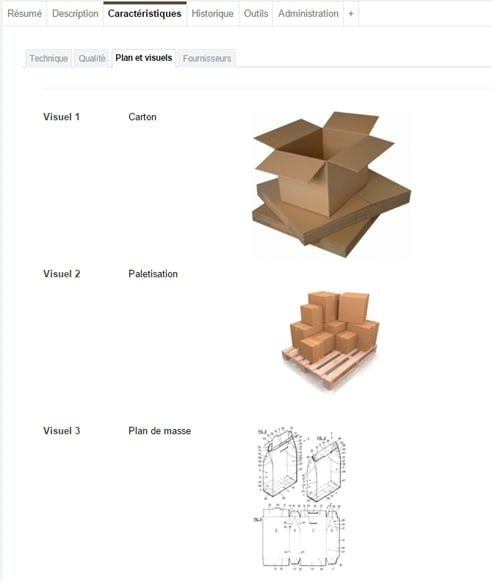 Nuxeo also allows us to define custom document types (content objects), such as ‘packaging’ (see image, below), and ‘end product,’ each with their own set of metadata. These custom document types in turn enable us to link products together based on common attributes, such as common raw materials and similar packaging. Keendoo not only utilizes Nuxeo on the back end for its schema-flexible data model and workflows, but on the front end as well. We maximize the use of all layers of the Nuxeo Platform, inside and out. Keendoo uses Nuxeo’s built-in web UI framework just as actively as its data model and workflows. Presently we have over 50 standard web layouts using Nuxeo’s web UI tools. Instead of silos of departmental spreadsheets, Keendoo ensures all product information is constantly and accurately updated into the Nuxeo repository. > Our solutions include custom workflows for each department – R&D, QA, Sales and Marketing – to systematically provide all required information, says Christophe Mahé. > Validation workflows ensure accuracy while flagging errors to be corrected. The validated data is then mapped to the appropriate metadata and custom document type. Finally, we provide custom workflows to calculate nutritional values, allergens and product costs automatically as product recipe ingredients or related metadata is modified. This view shows a food product’s nutritional values for labeling purposes. These values automatically recalculate as changes to the recipe are made. Another major reason Keendoo selected Nuxeo was the availability of Nuxeo Studio for easy customization of the platform. Delivered as an online service with a graphical user interface, Nuxeo Studio enables application builders to customize without coding, greatly reducing time and resource requirements for Nuxeo Platform-based content management applications. Nuxeo Studio has offered significant time savings for our developers as they built our applications. Just as important, it allows our consultants and clients to quickly take ownership of the customization requirements for their applications. Acting on strong customer feedback, Keendoo recently added significant new core functionality by adding a new integrated project management module – fully developed using the Nuxeo Platform. We added new related document types such as ‘project’ and ‘task’. Each task is an individual document, associated with a project and managed through custom workflows. These project workflows can be very complex – some comprise over 30 steps with assignees for each task – and we have now fully automated them using the Nuxeo Platform. Dramatically faster, easier and less costly regulatory compliance. Keendoo estimates its customers save an average of 75% or more of personnel hours previously devoted to declaring product ingredients, calculating nutritional values and labeling. Additionally, customers no longer incur the expenses of laboratory testing of product samples to determine nutritional information, as these results are now automatically calculated by Keendoo based on data for all ingredients in the product recipe. Reliable calculations of revenue and cost controls. Nuxeo’s data model allows Keendoo to calculate product revenue (integrated from ERP and other systems), for example, by active recipe, which has evolved over time. The result a much more deeper, insightful analysis to gauge success as consumers’ tastes change over time. Additionally, automatically calculated product simulations include cost per unit including raw material costs. Strong company-wide collaboration: a new competitive advantage. Silos of information are replaced with significant improvements in cross-departmental collaboration, further expediting time to market and responsiveness to consumers, while eliminating costly and frustrating operational inefficiencies. Keendoo recently added a SaaS offering to its product mix, k.INCO, providing European food producers with INCO-mandated nutritional labeling as a service. The SaaS-based module is powered by Nuxeo Cloud, which enables rapid and secure deployment of Nuxeo applications on a cloud infrastructure, providing multi-tenancy and high availability while reducing costs. Mega-Retailers. Keendoo helps superstore retail chains optimize sales performance of their private label/store brand food products with limited shelf space. The company is also pursuing opportunities to dramatically expand the presence of their solutions across retailers’ supply chains, down to the individual supplier level. Restaurants. Keendoo provides effective product information management for restaurant chains, some of which are also obligated to disclose nutritional information, while others do so voluntarily to better serve and engage with health-conscious customers. Looking further ahead, Keendoo foresees ample opportunity to adapt their solutions for other industries, including retail (beyond food products), chemicals and pharmaceuticals. Because the Nuxeo Platform provides a highly flexible data model and fully extensible API, Keendoo can pursue these and other verticals with confidence, knowing they have a future-proof business application development platform designed for constant change. The flexibility of the Nuxeo Platform has enabled us to develop and deploy new functionality in a very agile way. Nuxeo is the foundation of our product information management strategy, including our plans to expand our customer base beyond food producers to many other industries.